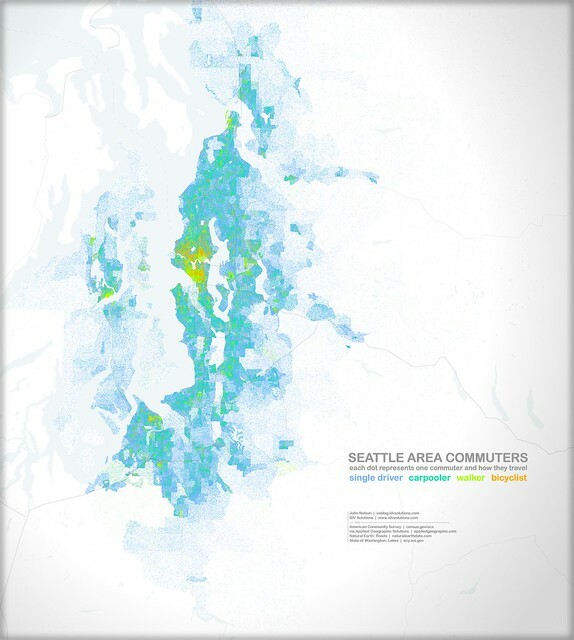 Here is a series of maps looking at how folks there get around the Metro Seattle area (I used the Seattle-Tacoma-Bellevue and the Bremerton-Silverdale metropolitan areas). It was a sort-of natural follow-up to the set of maps that looked at the rate of alcohol-related crashes then a per-capita look at driving in cities. So here is an overtly *capita* per-capita look at commuting. Hat tip to Brandon Martin-Anderson's inherently appealing direct relationship of people to dots, which seemed to work well for looking at the commuting characteristics of a city. 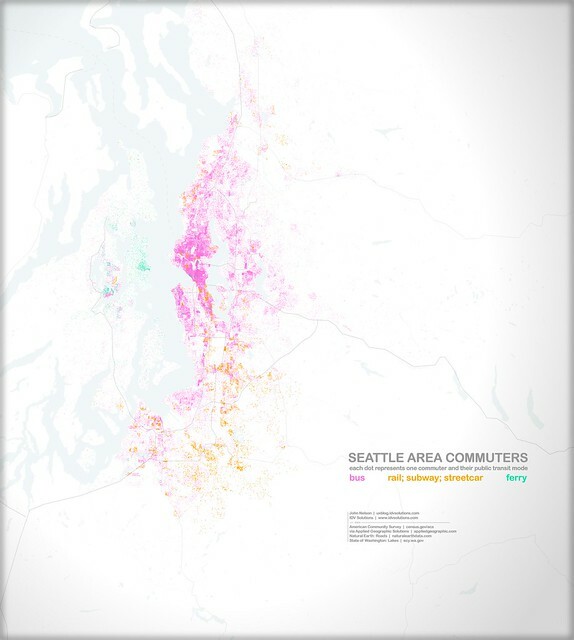 Anyways, here's an initial peek at where people live and how they get to work...around Seattle. Private transit methods of getting there and back. Each dot is one commuter, and how they get around. Poster. Public transit methods of getting there and back. Each dot is one commuter, and how they get around. Poster. How many people do you cram into that car? Each dot is one commuter and how much/little elbow room they have. Poster. Not a people dot map, but a useful companion. This shows the average commute times around the area, aka the multiplier of per capita forfeited life-time or aka the corollary volume of books-on-tape ownership, or aka the commensurate rate of prescribed statins. Poster. It seems to me Seattle has a pretty diverse set of transportation options, set amid a pretty rugged surface with plenty of peninsulas, inlets, and other choke points to maneuver around or over. You've got a pretty broad set of public transportation options, lots of bedpost communities sleeping city commuters whom (who or whom, I can never tell?) I suspect may be inclined to share rides, and a climate that would seem to support bicycles (and mud-spattered backs) much of the year. Any surprises? The statistics come from the US Census Bureau's American Community Survey. I extracted the data from a tool provided by our data partner, AGS. The road (and ferry) network comes from Natural Earth, where a bajillion physical and cultural boundary layers are available for freez. 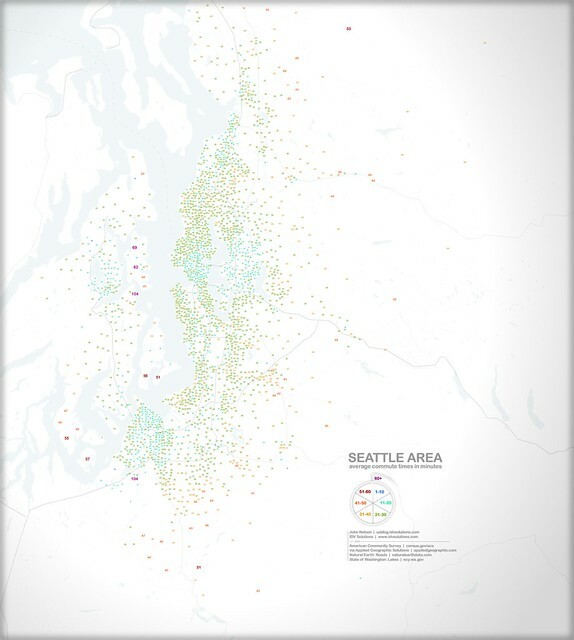 The shape of the Seattle area comes from the super convenient State of Washington's Dept. of Ecology downloads page. For print options regarding these maps, visit here. Hi! It's me, Brandon! I think this is the best thing ever! Great maps, only quibble is with the snarky descriptions of the average commute times -- as a bicycle commuter, my commute is neither forfeit time nor an invitation to statins. But I can see my lonely orange dot in a sea of blue neighbors, maybe I'm the exception that proves the rule? "who", since it is a subject ("who [...] may be inclined"). "whom" is used as an object.